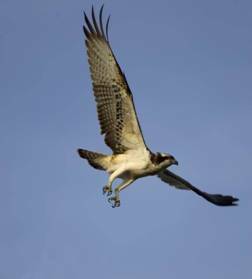 The Bassenthwaite osprey story begins in 1997 when two juvenile birds stayed at Bassenthwaite Lake for a short time during the summer. Two birds again returned in 1998 staying from mid April until 17 August and it was observed that one of the birds had a green ring on its leg with the letters SX. With this information we discovered that it had been ringed as a nestling on Speyside in July 1995 and it is believed that this was the first sighting of the female bird that has returned to Bassenthwaite each year until her last visit in 2006.
wasn’t to be this year but things were looking promising. 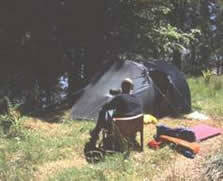 At this time very few people were aware of these events so 2001 was awaited eagerly. 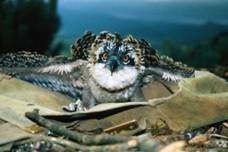 It was in the winter of 2000 that the Lake District Osprey Project (LDOP) was formed to plan for the time when breeding occurred, protecting the birds and allowing for locals and visitors alike to enjoy the unique experience. 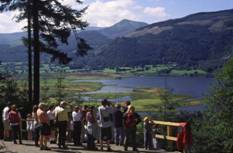 The project brought together three organisations, The Lake District National Park Authority, The Forestry Commission and the RSPB. Sure enough the birds returned in April 2001 and wonder of wonders the two birds were observed mating, eggs were laid and incubation began….. as did the start of their protection. This was, of course, the year that Foot and Mouth Disease ravaged Britain and northern Cumbria in particular. This was both an advantage and a disadvantage. On the positive side, staff were released from other duties and showed tremendous dedication, concentrating for long hours, often in the freezing cold, watching out for unwanted intruders. All were kept going by the will to protect these special birds from egg collectors. The Cumbria Constabulary also gave vital and enthusiastic back up. On the negative side Foot and Mouth Disease had got a firm grip by April and caused problems of access at the best watch points. 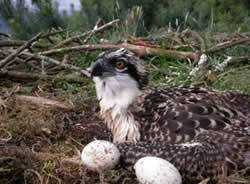 Then, on 13 June 2001 the first osprey recorded in Lake District history hatched. 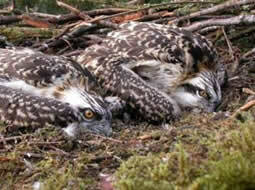 The Bassenthwaite ospreys had reared a single chick which was subsequently ringed and a red colour ring placed on its right leg—hopefully to aid further re-identification. 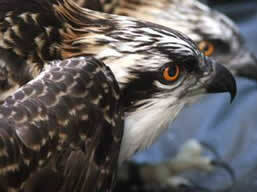 Because of the ring colour and number this first osprey was affectionally known as Red 15. Indeed 2007 has seen the 500,000th visitor come to view the ospreys and she, and her husband, were met by Eric Robson and staff from the project and given some mementos from the project including some new binoculars to remember her visit. In 2007 the usual female, with the light green colour ring, didn’t return from Africa and indeed the male himself was unusually late in returning. 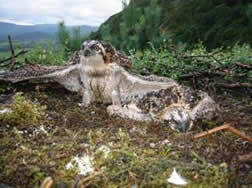 However he did return only to find, both to our amazement and presumably to his, a new female was on the nest site. Given that we assume this was the first time she had nested it has been extremely pleasing to see her first lay 3 eggs and then successfully rear 3 chicks –the second year running this has happened. The first of these chicks flew off the nest on July 31st and the 3rd on eon the 7th August, now making a total of 13 chicks that have flown from the Bassenthwaite nest. It now wont be very long before the female leaves the nest and returns to Africa—her work done for this year. The male will stay feeding the 3 chicks until he feels he is no longer needed then he also starts his long journey back south. Lastly the chicks will head south---how they know where to go and by which route is still one of life’s mysteries.